I’m a big fan of tuna salad sandwiches. They’re easy and quick to make, are relatively healthy, and are equally as good as an office lunch or in a picnic basket. I know the picture doesn’t look that great, but no picture could possibly display how awesomely fantastic the sandwich tastes! Mix all the ingredients together and slather on the toast. There are three key ingredients at work with this version. First off is the lemon juice and zest…it gives the tuna a light, summery flavor that hits immediately. Second is the toast…if you try it straight from the bowl, it just isn’t as good; you need a warm, dry piece of bread to help the flavors burst in your mouth. Third is the cottage cheese…you don’t taste it at all, but it makes the tuna salad so rich and creamy. 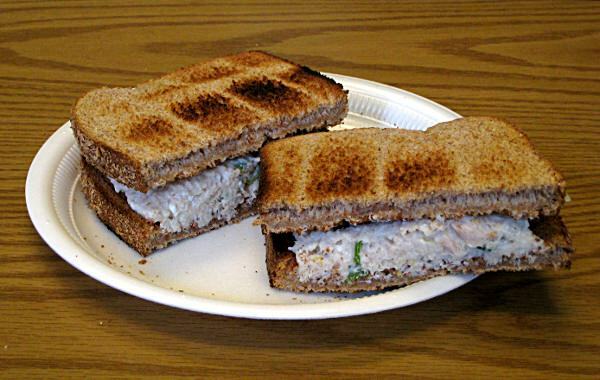 Next time you have tuna salad, don’t settle for tuna and mayo, try the above. You won’t regret it.